Loading control proteins are known to be constitutively and stably expressed at high levels in almost all tissues and cells. Housekeeping proteins, such as GAPDH , beta-tubulin and beta-actin , represent some of the popular loading control proteins. Loading control antibodies help determine whether samples have been loaded equally in each lane. This information is needed to determine whether the difference in levels of the protein of interest in different samples is due to loading variance or sample-to-sample expression level differences. View more about loading control FAQs. 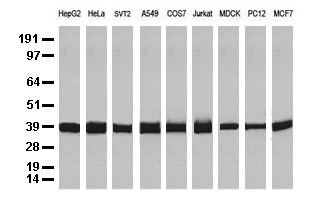 Immunogen: Full length human recombinant protein of human GAPDH (NP_002037) produced in HEK293Tcell. Beta-actin is an isform of actin proteins. 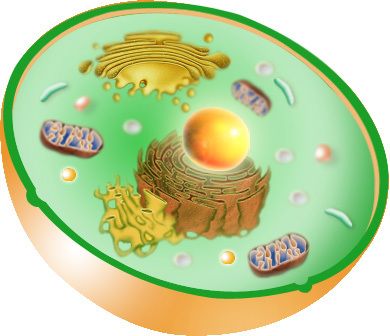 Actins are highly conserved proteins that are involved in cell motility, structure, and integrity. There are six different but highly conserved actin isoforms in vertebrates. Four of these isoforms are expressed primarily in striated and smooth muscle cells, whereas the two cytoplasmic β-actin and γ-actin isoforms are ubiquitously expressed. Conserved from birds to mammals, β-actin and γ-actin differ at only four biochemically similar amino acid residues. These amino acid differences confer different biochemical properties between the two isoforms. Beta-actin is a major constituent of the contractile apparatus. Beta-tubulin , is a subunit of tubulin. Tubulin is one of several members of a small family of globular proteins. It is the major constituent of microtubules. There are two of the most common members of the tubulin family: alpha-tubulin and beta-tubulin, and together their dimers form microtubules. The dimers of alpha- and beta-tubulin bind to GTP and assemble onto the (+) ends of microtubules while in the GTP-bound state. After the dimer is incorporated into the microtubule, the molecule of GTP bound to the beta -tubulin subunit eventually hydrolyzes into GDP through inter-dimer contacts along the microtubule protofilament. Beta-tubulin faces the plus end of the microtubule while alpha-tubulin faces the minus end. Dimers bound to GTP tend to assemble into microtubules, while dimers bound to GDP tend to fall apart. GAPDH, less commonly as G3PDH, is the abbreviation of Glyceraldehyde 3-phosphate dehydrogenase. It is an enzyme of ~37kDa that catalyzes the sixth step of glycolysis and thus serves to break down glucose for energy and carbon molecules. GAPDH is considered a housekeeping gene because this gene is often stably and constitutively expressed at high levels in most tissues and cells. So GAPDH is commonly used by biological researchers as a loading control for western blot and as a control for qPCR.